For manual transmissions, maintenance beyond the fluid change intervals probably consists of looking for leaks and inspecting the fluid levels. Even service that includes a fluid change may not go much further than leak inspection and fluid change. Unless the vehicle came in with a transmission-related concern, not much else would seem necessary. However, the key word in “preventative maintenance” is preventative. The whole idea is to keep the vehicle in service and trouble free to avoid downtime. Inspect for loose clutch housing and transmission mounting fasteners. It is surprising how vibration and everyday operation will work fasteners loose. Keeping them tight helps keep movement and subsequent wear to the mounting surfaces at a minimum. Such wear can cause vibration issues (and more wear) as well as drivetrain alignment problems. Misalignment and vibration may also result in components breaking and discomfort for the driver. Check clutch linkages or hydraulic clutch components for wear and damage. If possible, remove the clutch housing cover for a visual inspection of the clutch fork and throw-out bearing. 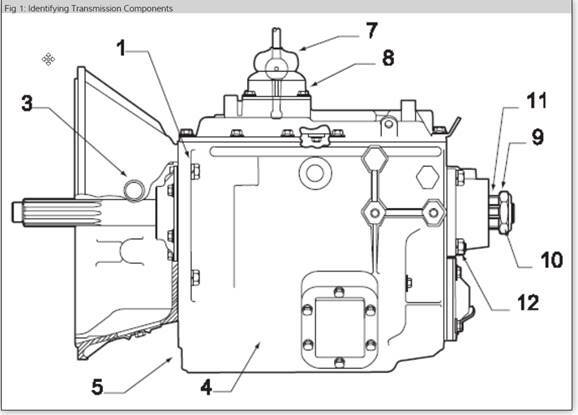 In some cases this inspection will reveal leaks from hydraulic clutch in some applications. Check output shaft flange, driveshaft, driveshaft bearings and mounts, and universal joints for looseness, wear or damage. For vehicles equipped with transmission mounted Power Take-Off, inspect those mountings and related drive parts along with and cables and linkages. Transmissions may be hidden from view most the time, but they still need regular care to maintain smooth trouble free operation. Refer to your truck repair information resource, like TruckSeries from Mitchell 1, for information and detailed procedures. These inspections do not take much time and can potentially save a lot of downtime and unnecessary expense, preventing little issues from turning into big failures. Prev:Disconnecting The Battery With The Engine Running?